More than 50 years into the age of nuclear energy, one of the biggest growth opportunities may be junking old reactors. The physical work involved in tearing down a nuclear plant takes about 10 years, according to John Hickman, a project manager in the U.S. Nuclear Regulatory Comission’s decommissioning branch. Companies that specialize in razing nuclear plants and hauling away radioactive waste are poised to benefit. Disposal work is where companies are going to make their fortune. Contractors that are usually involved in building reactors, including Bechtel Group Inc. and URS Corp (URS), are going to be looking very hard at the decommissioning side of it. Razing a plant is tricky business. Radiation can seep into the concrete, pipes and metal of plant structures, and workers need to be able to break down the units without exposing themselves, or the public, to contamination. 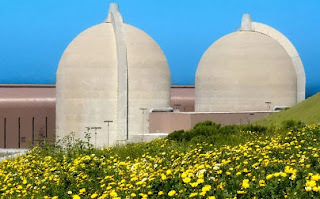 Plants often sit idle for decades before being torn down in order to let radioactive material decay. Entergy Corp. said Aug. 27 it will close its 41-year-old Vermont Yankee nuclear plant in 2014, making the reactor the fifth unit in the U.S. marked for decommissioning within the past 12 months, a record annual total. With Dominion Resources Inc, Duke Energy Corp and Edison International shuttering reactors this year -- and Exelon Corp is planning to close its Oyster Creek plant in 2019 -- the U.S. nuclear fleet of 104 units is shrinking, even as Southern Company and SCANA Corp. build two units each. 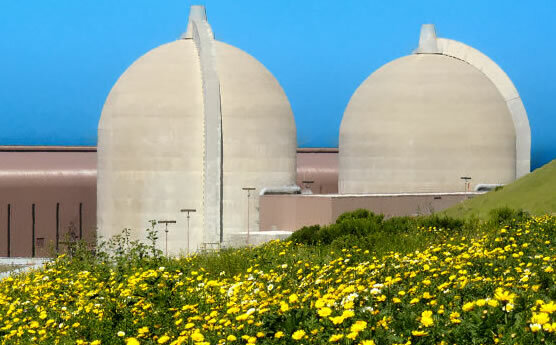 The reasons vary: Edison and Duke are permanently removing damaged plants from service. Entergy and Dominion are retiring the units because of factors including a glut of natural gas, a competing fuel. The U.S. Nuclear Regulatory Commission gives reactor owners 60 years to complete decommissioning, which it defines as permanently removing a plant from service and reducing radioactivity enough for the property to be used for another purpose. The NRC is now overseeing 14 commercial reactors that are in some phase of decommissioning, excluding those marked for closure in the last year. The first plant to deliver commercial power in the U.S. was a General Electric Co.-designed unit near Fremont, California, which began service in 1957, according to the NRC. It was also the first unit to be decommissioned, in 1963. The whole objective of decontamination is to get the dose levels as low as possible so you can do the dismantlement work. During a reactor decommissioning, the plant operator transfers radioactive fuel rods to cooling pools and, ultimately, to so-called dry casks for storage. Workers clean contaminated surfaces by sandblasting, chemical sprays and hydrolasing, a process that involves high-pressure water blasts. You do get to a point that you need someone to come in who has the equipment and the technology to actually dismantle the components. That typically is hired out. When such work begins at a plant, it can create business for companies including EnergySolutions Inc. of Salt Lake City and Waste Control Specialists LLC of Dallas, both closely held, and US Ecology Inc of Boise, Idaho. The companies dispose of low-level radioactive waste, including components and buildings at nuclear power plants. 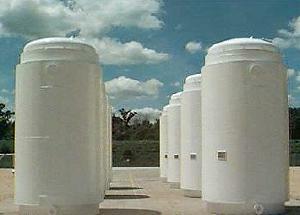 stored at about 75 operating and closed reactor sites across the country. The fuel will probably remain on site until lawmakers establish a plan for temporary or permanent disposal. House Republicans have said the U.S. should resume its work on the Yucca Mountain repository, a move that President Barack Obama’s administration and Senate Majority Leader Harry Reid, a Nevada Democrat, oppose. 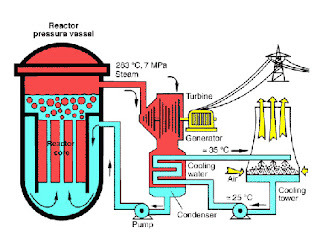 There’s a great opportunity for WCS in the decommissioning of nuclear-power plants. The company last year opened a West Texas facility where parts of nuclear-plant buildings and reactor components are sent for burial in steel and concrete containers 120 feet underground. WCS expects to begin taking some of the material from Entergy’s Vermont Yankee plant, at Vernon, Vermont, once the utility begins dismantling it, due to an agreement between Texas and Vermont for waste disposal. Chicago-based Exelon in 2010 transferred the license for its Zion plant to EnergySolutions, a nuclear-services company that operates low-level disposal sites in Clive, Utah, and Barnwell, South Carolina. The two-reactor plant, about 50 miles north of Chicago, had been closed since 1997. When EnergySolutions completes the $1 billion, 10-year dismantling and disposal process, it will transfer the license back to Exelon, according to the utility. EnergySolutions later this year will begin the process of transferring spent fuel to a storage area at the Zion facility. Knocking down structures will begin later. EnergySolutions doesn’t have contracts in place to work on reactors that have been slated for decommissioning. They do hope there’s opportunity there. Waste Control Specialists is doing some of the decommissioning work at Zion. It is hard for new companies to get into the business. The regulatory framework in this arena is so lengthy, it’s going to take a long time for somebody to be up and running to dispose of this type of waste. Larger contractors that have experience in the area also are watching the plant closures closely. Bechtel has considerable experience in nuclear decontamination and decommissioning. They are closely monitoring opportunities in the commercial sector and plan to be a major player as the market evolves. US Ecology’s low-level waste disposal site southeast of Boise, Idaho, is disposing of the lowest level of waste from plants including PG&E Corp’s Humboldt Bay reactor. The Humboldt Bay plant, near Eureka, California, has been out of service since 1976. Workers have been dismantling the unit since 2008. Trucks may haul away 50 loads of material, including concrete and steel, each week for four to five years.